More than half of online teens have created content for the internet; and most teen downloaders think that getting free music files is easy to do. More than half of online teens are Content Creators. Some 57% of online teens create content for the internet. That amounts to half of all teens ages 12-17, or about 12 million youth. These Content Creators report having done one or more of the following activities: create a blog; create or work on a personal webpage; create or work on a webpage for school, a friend, or an organization; share original content such as artwork, photos, stories, or videos online; or remix content found online into a new creation. The most popular Content Creating activities are sharing self-authored content and working on webpages for others. 33% of online teens share their own creations online, such as artwork, photos, stories, or videos. 32% say that they have created or worked on webpages or blogs for others, including those for groups they belong to, friends or school assignments. 22% report keeping their own personal webpage. 19% have created their own online journal or blog. About one in five internet-using teens (19%) says they remix content they find online into their own artistic creations. 19% of online teens keep a blog and 38% read them. 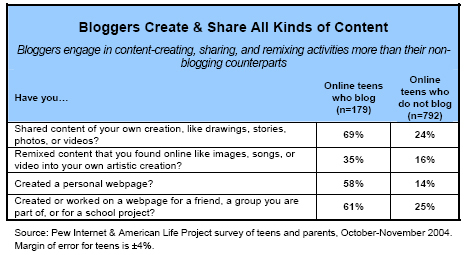 Teens are much more likely than adults to blog and they are also more likely to read blogs. Blogs are a type of webpage, typically created and maintained with software that allows internet users to easily post material to a webpage, usually displaying the material in reverse chronological order with the newest items at the top. 19% of online youth ages 12-17 have created their own blog. That is approximately four million people. 38% of all online teens, or about 8 million young people, say they read blogs. Older girls lead the blogging activity among teens. Teens who go online frequently are more than twice as likely to blog; 27% of daily users have their own blog, compared with 11% of those who go online several times a week, and 10% of those who go online less often. Teen bloggers are tech-savvy and heavy internet users. Bloggers and to a lesser extent teens who read blogs are a particularly tech-savvy group of internet users. They have more technological tools such as cell phones and PDAs and are more likely to use them to go online. Not only do they live in technologically rich households, but they are more likely to have their own computer at home and to be able to use it in a private space. They help adults do things online. Most strikingly, they have more experience with almost all online activities that we asked about. Bloggers are more likely than non-bloggers to engage in everyday online activities such as getting news, using IM or making online purchases, but content creating and sharing activities are the areas where bloggers are far ahead of non-bloggers. Half of online teens say they currently download music files and close to one-third say they download video. 51% of online teens say they download music files from the internet compared with 18% of online adults who were surveyed at the end of 2004. Roughly one-third of those teens (31%) who do not currently download music files say that they used to download music in the past. When projected on to the total population of online teens, this suggests that the total universe of teens with music downloading experience—those who are current or former downloaders—is about 66% of teen internet users. Nearly one-third (31%) of online teens say they currently download video files to their computer so they can play them at any time, while just 14% of online adults reported the same at the end of 2004. Older teen boys with broadband connections at home are the most likely to say they get music and video files online. Most teen downloaders think that getting free music is easy and it’s unrealistic to expect people not to do it. Teens who get music files online believe it’s unrealistic to expect people to self-regulate and avoid free downloading and file-sharing altogether. Out of the 622 teens in our survey who say they have tried music downloading, 75% agree with the statement that, “Music downloading and file-sharing is so easy to do, it’s unrealistic to expect people not to do it.” Just 23% disagreed with this statement. About half of them think free downloading and file-sharing copyrighted content without permission is generally wrong, yet roughly the same number say they do not care about the copyright on the music files that they download. Teens are as likely now to have paid for music online as they are to have tried peer-to-peer services. Equal portions of music downloading teens admit to current use of peer-to-peer (30%) and current use of online music services such as iTunes (30%) to get their music files. However, three times as many teens report peer-to-peer use in the past (28%) as those who report use of paid services in the past (9%).